Premium cutting tool from Golem Gear. Simple, yet very efficient. 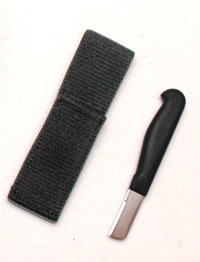 Double serrated blade cuts through most materials in a single slice. Blunt tip serves as a screwdriver and prevents accidental punctures. Includes pouch with 2" belt loop.